Obsidian paints the bleakest of futures. Minions of Hell have corrupted the Earth and, in this post-apocalyptic world, humankind stands on the brink of extinction. Desperate for survival, the remnants of Humanity have banded together to rebuild and to fight back within the confines of a structure called “The Zone.” The year is 2299. 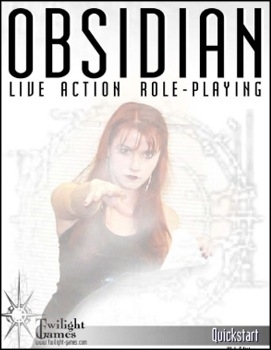 The Obsidian LARP project is based on the Obsidian: the Age of Judgement RPG from Apophis Consortium. This Quickstart offers a basic introduction to Live Action Obsidian gaming for fans of post-apocalyptic settings. This Quickstart contains the Live Action rules for all four starting Ethos (Mystics, Kultists, Corporates and Machines) from the Obsidian RPG as well as rules to explore the bleak future. If there is enough interest and feedback from fans, more Obsidian LARP products and expansions will be developed.